It’s time for another change at Augusta National. Verne Lundquist’s favorite Sunday pin on the 16th hole needs a refreshing. It has become too formulaic. You’ve all seen the highlights. Thirty paces on and four from the left has delivered meaningful birdies over the years. Tiger Woods’s epic chip in 2005. Jack danced around the cup en route to a deuce in ’86. 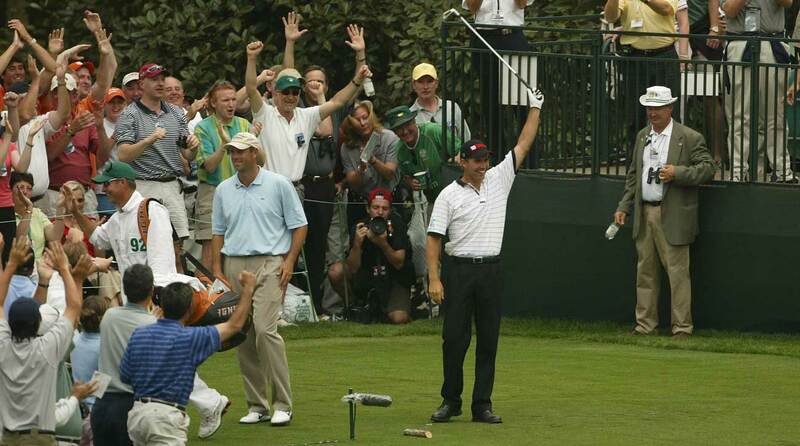 Phil Mickelson dropped a meaningful bird there during his victory in ’04. Those are great moments, though cherry-picked. Every hole at Augusta has these memories. And then we wait. Gravity tells the golfer if they’re lucky enough for the one instead of a two. Fans who tune in for their annual dosage of early-April golf adore it, but that’s not what major championship golf is about. Is the Masters about chasing entertainment, or a test of peak golf performance? Is a “funnel pin” good enough for the 70th hole of the greatest tournament in golf? Through five hours of play Sunday morning, the only holes at Augusta playing easier were the par 5s. But, but, but, aces! Players have been making the same exact creep-along-the-ground ace for years. Padraig Harrington did it in 2004. In the very next group, Kirk Triplett executed the same shot for the same result. Can you think of a different way in which a one or two has been carded there? Variability is a brilliant thing, and golf ought not be predictable. And yet, when you heard there was an ace made by Bryson DeChambeau Sunday morning, you knew where it took place. You knew the homogenized route. Not long after, Alex Noren did this. Playing from a short-sided bunker on Sunday at a major should not be this simple. But forget that! Wait a while and you’d see Jon Rahm spin it to four inches. Next up? Justin Thomas, spinning the same damn shot into the hole in the same damn way. Get rid of this hole, I say, and good riddance. Yes, a change here would fluster the Masters traditionalists to no end. How could we possibly flex that hole out of the rotation? Good news: We don’t have to! Sunday’s current pin should be moved to Saturday, Moving Day, where excitement builds and builds and builds all day. The Sunday pin location should be moved back to its roots, deep right on the green, where it used to be played. Want some history there? Think of Jack Nicklaus and his excited caddie in 1975. Getting close to that hole is as tricky as it gets. And the short-sided bunker long right? A book-it bogey. Chairman Fred Ridley promises that Augusta National is always considering changes that could be made to the course. Just this year, they revamped the 5th hole, lengthening it and making life downright scary for the best in the world. It rocked Tiger Woods’s week. A far simpler change is starting this championship in the face — one that would restore its 70th hole. Padraig Harrington reacts after making an ace at the 2004 Masters.